People who take large doses of certain vitamins and minerals risk permanently damaging their health, a government watchdog has warned. Experts from the UK's Food Standards Agency say high levels of minerals like beta-carotene and zinc over a long period may have irreversible harmful effects. In addition, they reiterated warnings that high doses of vitamin C, calcium and iron can harm health but said long-term damage can be avoided if people stop taking them. However, they say there is no firm evidence that chromium picolinate, which is found in some diet supplements, can damage DNA. There had been fears it can cause cancer. The group concluded that people who consume no more than 10mg of chromium per day are unlikely to suffer any problems. But It will be keeping its advice about chromium supplements under review and looking at evidence that emerges in the future. The findings follow a major review of 31 vitamins and minerals by the agency's expert group on vitamins and minerals. 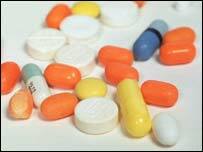 It concluded that most vitamins and minerals are safe if they are taken in doses that don't exceed recommended limits. However, it warned that five substances may cause permanent damage if they are taken in large quantities over a long period. beta-carotene - linked to an increased risk of lung cancer in smokers and people exposed to asbestos. It also advised people against consuming more than 10mg per day of vitamin B6 unless they are acting on medical advice. High intakes over a long period can lead to a loss of feeling in the arms and legs, the experts said. In addition the group warned against taking more than 1000mg of vitamin C, 1500mg of calcium or 17mg of iron per day. In high doses, these can all cause stomach pains and diarrhoea. However, the symptoms should disappear once people stop taking these supplements. The FSA board is expected to back proposals urging manufacturers to reduce the dose of potentially harmful vitamins and minerals in some supplements or place warnings on packets at a meeting later on Thursday. Sir John Krebs, chair of the FSA, said the report followed a thorough review of scientific studies. "While in most cases you can get all the nutrients you need from a balanced diet, many people choose to take supplements. "But taking some high dose supplements over a long period of time can be harmful. "We are using an extremely thorough independent expert review of the scientific evidence on the safety of vitamins and minerals as the basis for new advice to help consumers make informed choices." The supplements industry welcomed the report. Dr Ann Walker, an advisor for the industry-funded Health Supplements Information Service, said: "In addition to encouraging a healthy diet in order to achieve good nutritional balance, supplements can play an important role in maintaining health where people are not getting all they need from food alone." "Today's report highlights safe upper limits"